In 1850, the first patent for a mechanical dishwasher looked something like this: hand-powered and wooden. Today dishwashers are smarter, entirely mechanical, require minimal human effort, and hopefully give you more time for you and your family. However, washing dishes the old way – yes, by hand – could be giving you health benefits that no dishwasher can. “Mindfulness” is a term that a lot of people use in several areas and industries. For simplicity’s sake, we will understand mindfulness as “a state of active, open attention on the present.” That is, being self-aware and focused on the exact actions you are performing instead of thinking of the past or the future. In other words, being in the now. 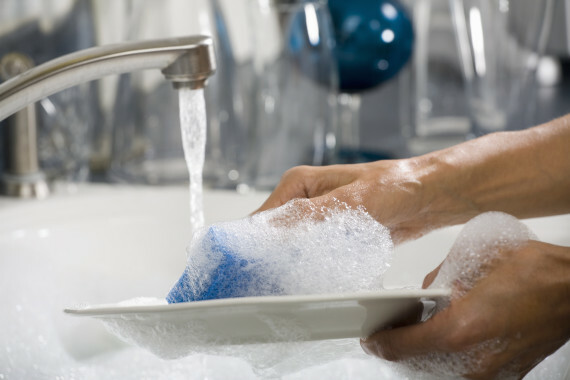 Studies suggest that handwashing dishes is linked to mindfulness and may affect our health in a few ways. We’ve listed them below as sub-benefits. In one Florida State University study, researchers had half a group read a brief descriptive dishwashing passage while the other half read a brief mindfulness dishwashing passage. Afterward, the fifty-one students washed dishes. A large part of the study’s aim was to see if handwashing dishes could be used to promote a mindful state and thus, wellbeing. Interestingly, researchers observed a 25% increase in feelings of inspiration and a 27% decrease in nervousness levels in those who washed dishes mindfully. Moreover, the non-mindful dishwashers reaped no benefits from the task. When you consider that some research reveals that washing dishes is the number one cause of disagreement among household tasks, the word “relax” seems wildly out of place. The “hygiene hypothesis” maintains that humans can benefit from getting dirty! Further, it seems that hyper-clean environments are a huge reason why child allergies have dramatically increased in recent years. In fact, a 2015 Pediatrics study found that handwashing dishes lessened the risk of developing allergic diseases in children aged seven to eight. Researchers concluded that diseases in children from families who use handwashing were less common than those that machine-wash their dishes. So while handwashing dishes is a messier and longer task, it can benefit you and your children’s health in the long-run. And these benefits are something you miss out on if you put your dishes straight into the machine washer. One chore that many kids dread is doing the dishes. Very few people enjoy dealing with scummy dishwater, floating food particles, and prune-y fingertips. Okay, we’re making sound way worse than it is. Regardless of how gross the idea of handwashing dishes may be, the act of it teaches kids to clean up after themselves. Parents can sometimes ask or tell their kids to do something without explaining why. But if you take the time to explain the importance of cleaning up after themselves (in addition to the health benefits), they will likely remember your life lessons. And when the day comes when they grow up and leave for school or buy their own places, washing dishes will be a skill they will have for life. Unless you use special or delicate dishes all the time, this probably won’t affect you significantly. But for those family functions where you bring out the matching dish set or your great grandmother’s china, you might avoid dishwashers. Even on a delicate wash cycle, you shouldn’t leave special dishware like that to chance. Instead, wash it by hand. This way you’ll have full control of how gently you wash them, how hot the water is, and where you place them for safe keeping. Sometimes the old-fashioned way is the best way. Whether you have one kid or more, handwashing dishes is a perfect opportunity to bond with your children. Pull up a chair or stool and find a system that works for all of you. Maybe you wash and they dry or they dry and you wash. Oh, and some extra bubbles never hurt anyone (if you’re looking for a laugh). Washing dishes together allows you to ask about their day, learn more about their interests, answer those questions they may have, and more. You know as well as us that kids truly do “say the darndest things.” Chances are you’ll reflect on this brief but meaningful time with them and remember these moments when you need them most. This one isn’t entirely true because it depends entirely on your personal dishwashing habits. In one study from the University of Bonn in Germany, researchers found that handwashing uses more energy. 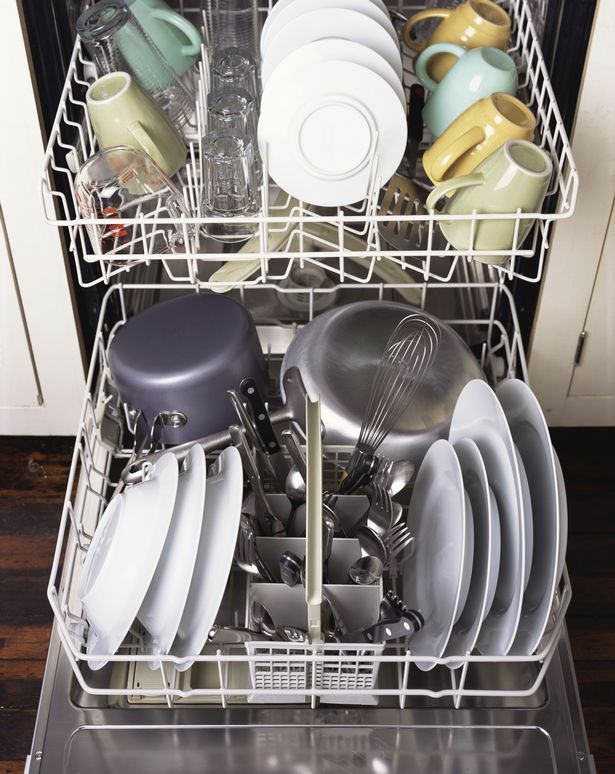 In comparison, dishwashers use less soap, one-sixth of the water, and half the energy. The study makes a good case to keep using dishwashers but researchers acknowledge that they need more studies like this to test heavy soiled dishes and real household conditions. However, you can do a couple of things to make your handwashing more time-efficient and energy-saving. If any, try to scrape as much leftover food off your dishes as possible. You can also keep the water off as you scrub the dishes with soap. Mainstream store-bought dish soaps often contain harmful chemicals. The FDA has even banned some anti-bacterial dish soap brands. Many brands also use artificial fragrances that may cause medical problems. To avoid these negative health effects and create a safer home for you, your family, and the environment, we’ve created a guide to choosing safe dishwashing products. Castile Soap is also a fantastic natural alternative to incorporate into your dishwashing. Next articleEver Wondered Why Hotels Rarely Have Room No. 420?